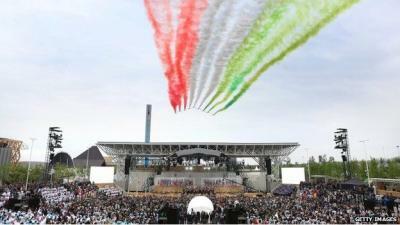 Expo 2015: highlighting Italy’s problems? MILAN- At the universal exposition’s opening ceremony on 1 May, Prime Minister Renzi stated that “Italy has awakened, we are ready for life.” While one does hope that hosting Expo 2015 will prove beneficial for the country, it seems that the event has put the spotlight on a number of issues in Italy. The entire expo process could even be described as a microcosm of these problems. On an economic level, it is hoped that the Expo will provide something of a revival for Italy. However, opposition such as the No Expo movement and the Black Bloc protestors that filled the city streets on the day of the exposition’s opening serve as a reminder of financial difficulties faced by the country, and how these affect different groups. Enmity to the event is based on the view that it has been put together at the expense of young people working for free or on low wages. Protestors are also against the spending of public money on such a project during a period of economic hardship. In the run-up to the exposition’s opening, a number of raids were carried out in the business capital, during which clubs and Molotov bombs among other dangerous equipment were seized from anti-austerity anarchists. This proves that there are those willing to resort to extreme, dangerous measures to stand up for what they believe. Moreover, bureaucratic delays have proved a nightmare for many; for instance, COPAGRI, a confederation of agricultural workers, told ANSA that their contract signed a year and a half ago, but that permission to start works was only granted on 10 March this year. Overall, more than twenty million visitors are expected to attend the 184-day extravaganza which sees the participation of 145 countries from around the world. At the time of writing, work in many areas of the Milan Expo site is far from being complete. If nothing else, this shows some truth behind the stereotype that Italians are always late.